Many people think that when Buoy 10 ends the masses stop fishing for Chinook. However, we’ve had great fishing further upstream on the Columbia for more than a month and action should remain status quo through late October with more and more fish coming in. The fishing is getting better and better here in Eastern Washington. Usually, this is when we get really good salmon fishing. Early October is great time to fish the Hanford Reach, but there’s a mix of fish up there. Some of them are bright and some of them are starting to get pretty dark. 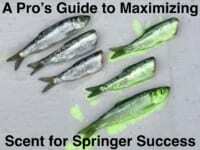 That doesn’t matter to most anglers. It’s a blast to catch the numbers of salmon we do up here. The last few years we’ve had smaller fish. Meanwhile, this year’s crop it impressive. This is where it should be. This is how it used to be. A 20 pounder was a large fish last year, but this year it doesn’t turn heads. No one cares about a 20 pounder anymore. It has to be greater 30 to turn heads here. We’re seeing big fish daily. I enjoy fishing The Reach because it’s the longest free flowing section of the Columbia. You get long beautiful drifts with a diver and eggs. There’s not a lot of places where you can go and target 30-pound fish, but here you can and we do it every day. You catch fish from eight to 60 feet deep and everywhere in between. As long as there’s a current break there will be salmon. I started the season with plugs. We used Super Baits every day. However, as the water temperature has fallen the egg bite has taken center stage. This is that time of year when you are running all eggs. 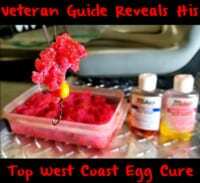 I coat my eggs in Red Fire Cure and then add Red Fire Brine and Fire Power. It’s all about eggs right now. As the salmon start getting into pre-spawn mode they hammer eggs. Early in the season herring is big, but later in the season eggs are money. I like pink eggs, but the salmon like the red ones and that’s why I’m using them. I’m getting some on pink and I’m still using it daily, but they are biting my red ones more than they are biting my pink ones. I’m fishing eggs on a 4/0 Gamakatsu hook with 30-pound Maxima Ultragreen. I’m running all the eggs under a diver and with a Yakima Bait Spin N Glo. I’m targeting the upper section of the reach daily, but there’s fish from the mouth of the Columbia to Chief Joe Dam and everywhere in between. There’s just a ton of salmon in the river right now. And, we are still getting good numbers of fish coming in every day. It’s super fun. Anglers may keep six salmon, per day, of which only three can be adults. Hatchery and wild fish may be retained. Brad Wagner operates Bobber Down Guide Service. For more info on his fall Hanford Reach salmon trips please visit http://www.fishwenatchee.com.